The very best of Keuka Lake! Waterfront living, boat slip, catered meals! First class 2 bed / 1 bathroom accommodations in all new construction showcases granite countertops, stainless steel appliances, Italian marble bathroom, laundry! WiFi / boat slip / air conditioned! The covered veranda has unforgettable views of sunrise & moonrise over the hills & lake. Don't worry about driving - Snug Harbor's fun bar & restaurant facilities are just steps away! Call the restaurant for room service, or enjoy the waterfront boardwalk with wines of the Finger Lakes, cocktails, food, and entertainment before venturing back to your hideaway. This luxury suite at Snug Harbor is the best Keuka Lake has to offer! Brand new italian marble shower walls and floor and all new sink, vanity, laundry toilet, and shower with showerhead & wand! Your new living room opens on to a large covered veranda with direct views of Keuka Lake and the beautiful surrounding hills! 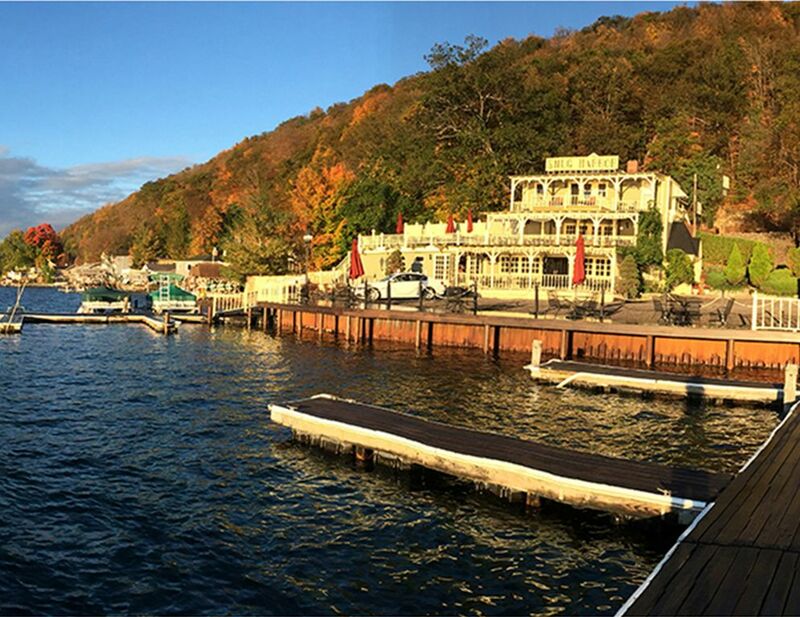 Snug Harbor is located on the shores of pristine Keuka Lake. From our 280 feet of lake frontage, you can dock your boat or enjoy the beautiful views from the boardwalk. Maximize your time on the lake with a Lyon Shaw dining set and seating areas on your private covered balcony. Eat in kitchen features wrought iron glass top table & chairs. Entertain plenty of guests on your covered patio, featuring Lyons Shaw cast iron furniture! This has got to be the nicest place to stay on the lake. The rooms were incredible - completely new and modern remodel. Wonderful full service dining lake side. Gorgeous views of the lake from almost every room. Very quiet and private accommodations. I can't recommend it enough. We will be back!! What luxurious comfort we fell into at Snug Harbor on Keuka Lake. The location on the lake was thrilling. From up high it was like we had the whole southern end of the lake to ourselves. The space was modern and elegant with a beautifully designed kitchen and bath. The bed was a cloud. We even went out on the balcony to toast the sunset before heading into the village for a great dinner. An afternoon stop at Dr. Konstantin Frank's Winery was not only a an opportunity to try new favorite wines in the both the Tasting Room and the 1962 Reserve Tasting Room but also an education in New York State viniculture and American winemaking in the grand European traditions. We brought some bottles home to stretch our Finger Lakes mini vacation. It was a great stay and now, winter seems almost over now! We'll be back and hope we can find availability as this is sure to be a popular destination. The place has everything you need for a relaxing getaway. It’s a very charming area. Would certainly go back. INCREDIBLE SLICE OF HEAVEN ON KEUKA LAKE! Decided to take a quick getaway and the pictures don't do this suite justice! They spared no expense on this second floor unit - comfortable sheets & bed, beautiful kitchen, well furnished. Check in was easy, and we happened to have amazing weather, so we enjoyed the view of the lake on the spacious covered porch. INSTANT RELAXATION - we can't wait to get back to Snug Harbor this summer too! The property was well maintained and had everything we could possibly need. The deck overlooking the lake was our favorite place to start and end each day. We would definitely return.